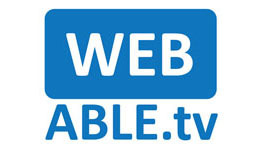 WebAble TV will be serving as the Official Webcaster for the 31st Annual International Technology and Persons with Disabilities Conference March 21 - March 26, 2016 in San Diego. The Science/Research Track Call for Papers is closed. For more information on the Journal on Technology and Persons with Disabilities and Scientific/Research Track at 31st Annual International Technology and Persons with Disabilities Conference, please visit our Journal page.